In his 1930 textbook The Principles of Quantum Mechanics, Paul Dirac introduced the uniquely quantum concepts of superposition and indeterminacy using polarized photons. Dirac's examples suggest a very simple and inexpensive experiment to demonstrate the notions of quantum states, the projection or representation of a given state vector in another basis set of vectors, the preparation of quantum systems in states with known properties, and the measurement of various properties. Any measuring apparatus is also a state preparation system. We know that after a measurement of a photon which has shown it to be in a state of vertical polarization, for example, a second measurement with the same (vertical polarization detecting) capability will show the photon to be in the same state with probability unity. Quantum mechanics is not always uncertain. There is also no uncertainty if we measure the vertically polarized photon with a horizontal polarization detector. There is zero probability of finding the vertically polarized photon in a horizontally polarized state. Since any measurement increases the amount of information, there must be a compensating increase in entropy absorbed by or radiated away from the measuring apparatus. This is the Ludwig-Landauer Principle. The natural basis set of vectors is usually one whose eigenvalues are the observables of our measurement system. In Dirac's bra and ket notation, the orthogonal basis vectors in our example are | v >, the photon in a vertically polarized state, and | h >, the photon in a horizontally polarized state. These two states are eigenstates of our measuring apparatus. The interesting case to consider is a third measuring apparatus that prepares a photon in a diagonally polarized state 45° between | v > and | h >. Dirac tells us this diagonally polarized photon can be represented as a superposition of vertical and horizontal states, with complex number coefficients that represent "probability amplitudes." 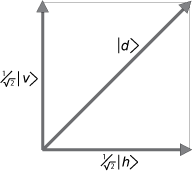 Note that vector lengths are normalized to unity, and the sum of the squares of the probability amplitudes is also unity. This is the orthonormality condition needed to interpret the (squares of the) wave functions as probabilities, as first proposed by Max Born in 1927. When these complex number coefficients are squared (actually when they are multiplied by their complex conjugates to produce positive real numbers), the numbers represent the probabilities of finding the photon in one or the other state, should a measurement be made. Dirac's bra vector is the complex conjugate of the corresponding ket vector. No single experiment can convey all the wonder and non-intuitive character of quantum mechanics. But we believe Dirac's simple examples of polarized photons can teach us a lot. He thought that his simple examples provided a good introduction to the subject and we agree. We use three squares of polarizing sheet material to illustrate Dirac's explanation of quantum superposition of states and the collapse of a mixture of states to a pure state upon measurement or state preparation. Here are the three polarizing sheets. They are a neutral gray color because they lose half of the light coming though them. The lost light is absorbed by the polarizer, converted to heat, and this accounts for the (Boltzmann) entropy gain required by our new information (Shannon entropy) about the exact polarization state of the transmitted photons. 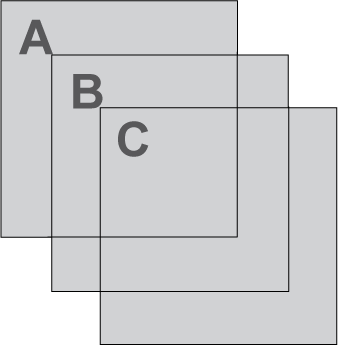 In figure 2, polarizers A and B are superimposed to show that the same amount of light comes through two polarizers, as long as the polarizing direction is the same. The first polarizer prepares the photon in a given state of polarization. 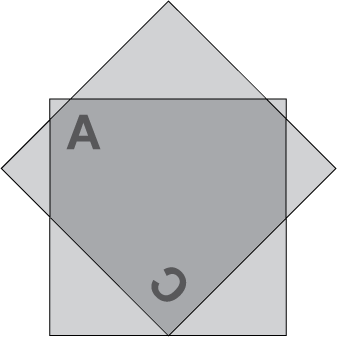 The second is then certain to find it in the same state. Let's say the direction of light polarization is vertical when the letters are upright. 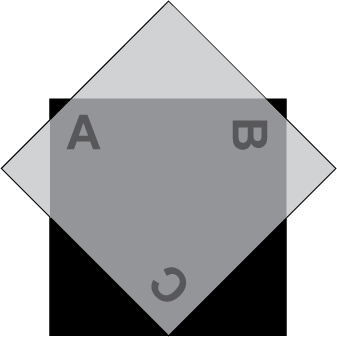 If one polarizer, say B, is turned 90°, its polarization direction will be horizontal and if it is on top of vertical polarizer A, no light will pass through it, as we see in figure 3. Fig.3. 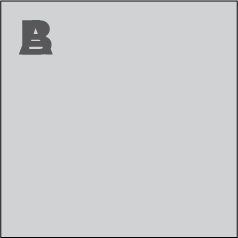 Polarizer B is rotated to horizontal polarization. No light comes through. As you would expect, any quantum mechanics experiment must contain an element of “Wow, that’s impossible!” or we are not getting to the non-intuitive and unique difference between quantum mechanics and the everyday classical mechanics. So let’s look at the amazing aspect of what Dirac is getting to, and then we will see how quantum mechanics explains it. We turn the third polarizer C so its polarization is along the diagonal. Dirac tells us that the wave function of light passing through this polarizer can be regarded as in a mixed state, a superposition of vertical and horizontal states. As Einstein agreed, the information as to the exact state in which the photon will be found following a measurement does not exist. We can make a measurement that detects vertically polarized photons by holding up the vertical polarizer A in front of the oblique polarizer C. Either a photon comes through A or it does not. Similarly, we can hold up the horizontal polarizer B in front of C. If we see a photon, it is horizontally polarized. From equation (1) we see that the probability of detecting a photon diagonally polarized by C, if our measuring apparatus (polarizer B) is measuring for horizontally polarized photons, is 1/2. Similarly, if we were to measure for vertically polarized photons, we have the same 50% chance of detecting a photon. Going back to polarizers A and B crossed at a 90° angle, we know that no light comes through when we cross the polarizers. If we hold up polarizer C along the 45 degree diagonal and place it in front of (or behind) the cross polarizers, nothing changes. No light is getting through. But here is the amazing, impossible part. If you insert polarizer C between A and B, some light now gets through. Note that C is slipped between A (in the rear) and B (in front). Fig.4. Light now gets through the intersection of Polarizer C with A and B. 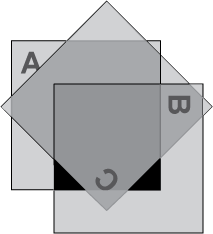 Note that C is slipped between A (in the rear) and B (in front). Let's start by removing the A polarizer from the back. This is the polarizer that prepared the state of the photons in vertical polarization state | v >. The light now comes through polarizer C first, which prepares it in a state of diagonal polarization | d >. We recall from equation (1) that | d > is a superposition of the basis vectors | v > and | h >. Only some of the diagonally polarized light from C gets through the horizontal polarizer B. What is happening here quantum mechanically? Fig.5. Polarizer C transmits diagonally polarized photons, only some of which get through the horizontal polarizer B. If A crossed with B blocks all light, how can adding another polarization filter add light? It is much less light than through C alone. We shall see why. Let’s start with the A polarizer in the back. It prepares the the photons in the vertical polarization state | v >. If we now had just polarizer B, it would measure for horizontal photons. None are coming through A, so no photons get through B. When we interpose C at the oblique angle, it measures for diagonal photons. The vertically polarized photons coming through A can be considered in a superposition of states at a 45 degree angle and a -45 degree angle. Photons at -45 degrees are absorbed by C. Those at +45 degrees pass through C.
C makes a measurement of 45 degree photons. It can also be viewed as a preparation of 45 degree photons. Only half the photons come through polarizer C, but they have been prepared in a state of diagonal polarization | d >. The original vertical photons coming through A had no chance of getting through B, but the diagonal photons passing through C (half the original photons) can now be regarded as in a linear superposition of vertical and horizontal photons, and the horizontal photons can now pass through B. Those vertically polarized will get absorbed by B, as usual. Recall from equation (1) that | d > is a superposition of the basis vectors | v > and | h >, with coefficients 1/√2, which when squared give us probabilities 1/2. Fifty percent of these photons emerging from C will pass though B. One quarter or 25% of the original A photons make it through. This happens if we send just one photon through at a time, just as with the two-slit experimant. Just as we can not say that the photon passes through slit A or B (only probabilities are moving in von Neumann’s process 2), we cannot say that our photons are in one state or another. They are in the mysterious linear combination that can collapse instantaneously into one state when a measurement is made. Suppose we have a beam of light passing through a [horizontal polarizer B], which has the property of letting through only light plane-polarized [horizontally]. Classical electrodynamics tells us what will happen for any given polarization of the incident beam. 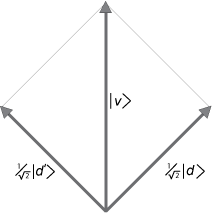 If this beam is [horizontally] polarized..., it will all go through the [polarizer]; if [vertically polarized], none of it will go through; while if polarized at an angle α, a fraction sin2α will go through. How are we to understand these results on a photon basis? A beam that is plane-polarized in a certain direction is to be pictured as made up of photons each plane-polarized in that direction. This picture leads to no difficulty in the cases when our incident beam is polarized [in the vertical or horizontal directions]. We merely have to suppose that each photon polarized [horizontally] passes unhindered and unchanged..., while each photon polarized [vertically] is stopped and absorbed. A difficulty arises, however, in the case of the obliquely polarized incident beam. Each of the incident photons is then obliquely polarized and it is not clear what will happen to such a photon when it reaches the [polarizer]. A question about what will happen to a particular photon under certain conditions is not really very precise. To make it precise one must imagine some experiment performed having a bearing on the question and inquire what will be the result of the experiment. Only questions about the results of experiments have a real significance and it is only such questions that theoretical physics has to consider. In our present example the obvious experiment is to use an incident beam consisting of only a single photon and to observe what appears on the back side of the [polarizer]. According to quantum mechanics the result of this experiment will be that sometimes one will find a whole photon, of energy equal to the energy of the incident photon, on the back side and other times one will find nothing. When one finds a whole photon, it will be polarized [horizontally]. One will never find only a part of a photon on the back side. If one repeats the experiment a large number of times, one will find the photon on the back side in a fraction sin2α of the total number of times. Thus we may say that the photon has a probability sin2α of passing through the [polarizer] ...and a probability cos2α of being absorbed. These values for the probabilities lead to the correct classical results for an incident beam containing a large number of photons. The foregoing discussion about the result of an experiment with a single obliquely polarized photon incident on a [polarizer] answers all that can legitimately be asked about what happens to an obliquely polarized photon when it reaches the [polarizer]. Questions about what decides whether the photon is to go through or not and how it changes its direction of polarization when it does go through cannot be investigated by experiment and should be regarded as outside the domain of science. Nevertheless some further description is necessary in order to correlate the results of this experiment with the results of other experiments that might be performed with photons and to fit them all into a general scheme. Such further description should be regarded, not as an attempt to answer questions outside the domain of science, but as an aid to the formulation of rules for expressing concisely the results of large numbers of experiments. The further description provided by quantum mechanics runs as follows. It is supposed that a photon polarized obliquely may be regarded as being partly in the state of [vertical] polarization and partly in the state of [horizontal] polarization... The state of oblique polarization may be considered as the result of some kind of superposition process applied to the two states of [vertical] and [horizontal] polarization. This implies a certain special kind of relationship between the various states of polarization, a relationship similar to that between polarized beams in classical optics, but which is now to be applied, not to beams, but to the states of polarization of one particular photon. This relationship allows any state of polarization to be resolved into, or expressed as a superposition of, any two mutually perpendicular states of polarization. Fig.6. The obliquely polarized photon is prepared in the state | d >, which can also be represented as a superposition of the mutually perpendicular states | v > and | h >. When we make the photon meet a [polarizer], we are subjecting it to an observation. We are observing whether it is polarized [vertically or horizontally]. The effect of making this observation is to force the photon entirely into the state of [horizontal] or entirely into the state of [vertical] polarization. It has to make a sudden jump from being partly in each of these two states to being entirely in one or other of them. Which of the two states it will jump into cannot be predicted, but is governed only by probability laws. If it jumps into the [vertical] state it gets absorbed and if it jumps into the [horizontal] state it passes through the [polarizer] and appears on the other side preserving this state of polarization. The reader may possibly feel dissatisfied with the attempt in the two preceding sections to fit in the existence of photons with the classical theory of light. He may argue that a very strange idea has been introduced — the possibility of a photon being partly in each of two states of polarization, or partly in each of two separate beams — but even with the help of this strange idea no satisfying picture of the fundamental single-photon processes has been given. He may say further that this strange idea did not provide any information about experimental results for the experiments discussed, beyond what could have been obtained from an elementary consideration of photons being guided in some vague way by waves. What, then, is the use of the strange idea? In answer to the first criticism it may be remarked that the main object of physical science is not the provision of pictures, but is the formulation of laws governing phenomena and the application of these laws to the discovery of new phenomena. If a picture exists, so much the better; but whether a picture exists or not is a matter of only secondary importance. In the case of atomic phenomena no picture can be expected to exist in the usual sense of the word 'picture', by which is meant a model functioning essentially on classical lines. One may, however, extend the meaning of the word 'picture' to include any way of looking at the fundamental laws which makes their self-consistency obvious. With this extension, one may gradually acquire a picture of atomic phenomena by becoming familiar with the laws of the quantum theory. With regard to the second criticism, it may be remarked that for many simple experiments with light, an elementary theory of waves and photons connected in a vague statistical way would be adequate to account for the results. In the case of such experiments quantum mechanics has no further information to give. In the great majority of experiments, however, the conditions are too complex for an elementary theory of this kind to be applicable and some more elaborate scheme, such as is provided by quantum mechanics, is then needed. The method of description that quantum mechanics gives in the more complex cases is applicable also to the simple cases and although it is then not really necessary for accounting for the experimental results, its study in these simple cases is perhaps a suitable introduction to its study in the general case. There remains an overall criticism that one may make to the whole scheme, namely, that in departing from the determinacy of the classical theory a great complication is introduced into the description of Nature, which is a highly undesirable feature. This complication is undeniable, but it is offset by a great simplification, provided by the general principle of superposition of states. Dirac describes the superposition of states with further comments on indeterminacy. The general principle of superposition of quantum mechanics... requires us to assume that between these states there exist peculiar relationships such that whenever the system is definitely in one state we can consider it as being partly in each of two or more other states. The original state must be regarded as the result of a kind of superposition of the two or more new states, in a way that cannot be conceived on classical ideas. Any state may be considered as the result of a superposition of two or more other states, and indeed in an infinite number of ways. Conversely any two or more states may be superposed to give a new state. The procedure of expressing a state as the result of superposition of a number of other states is a mathematical procedure that is always permissible, independent of any reference to physical conditions, like the procedure of resolving a wave into Fourier components. Whether it is useful in any particular case, though, depends on the special physical conditions of the problem under consideration. [Our example deals] with states differing only with regard to the polarization. When a state is formed by the superposition of two other states, it will have properties that are in some vague way intermediate between those of the two original states and that approach more or less closely to those of either of them according to the greater or less 'weight' attached to this state in the superposition process. The new state is completely defined by the two original states when their relative weights in the superposition process are known, together with a certain phase difference, the exact meaning of weights and phases being provided in the general case by the mathematical theory. In the case of the polarization of a photon their meaning is that provided by classical optics, so that, for example, When two perpendicularly plane polarized states are superposed with equal weights, the new state may be circularly polarized in either direction, or linearly polarized at an angle π/4, or else elliptically polarized, according to the phase difference. 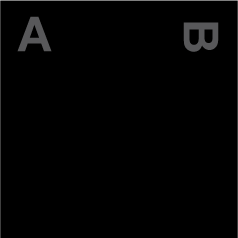 The non-classical nature of the superposition process is brought out clearly if we consider the superposition of two states, A and B, such that there exists an observation which, when made on the system in state A, is certain to lead to one particular result, a say, and when made on the system in state B is certain to lead to some different result, b say. What will be the result of the observation when made on the system in the superposed state? The answer is that the result will be sometimes a and sometimes b, according to a probability law depending on the relative weights of A and B in the superposition process. It will never be different from both a and b. The intermediate character of the state formed by superposition thus expresses itself through the probability of a particular result for an observation being intermediate between the corresponding probabilities for the original states,† not through the result itself being intermediate between the corresponding results for the original states. † The probability of a particular result for the state formed by superposition is not always intermediate between those for the original states in the general case when those for the original states are not zero or unity, so there are restrictions on the 'intermediateness' of a state formed by superposition. Fig.7. If a photon was initially prepared in the state | v > by polarizer A, it can also be represented as a superposition of states | d > and | d' >. Again, there is only a 50% chance of such a photon getting through polarizer C.